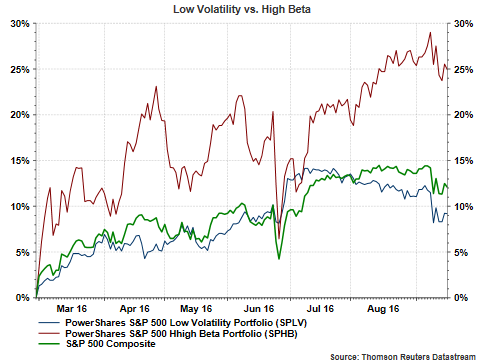 As early as about six weeks ago, some technical strategists were projecting a near trigger of the Dow Theory sell signal. In short, when the Dow Industrials and the Dow Transport Indexes are in an uptrend together, i.e. higher highs and higher lows, the market is in a bull market uptrend. 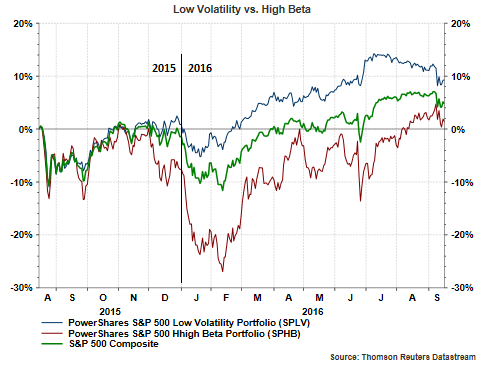 Conversely, when both indexes are making lower highs and lower lows, a bear market trend is in place or developing. 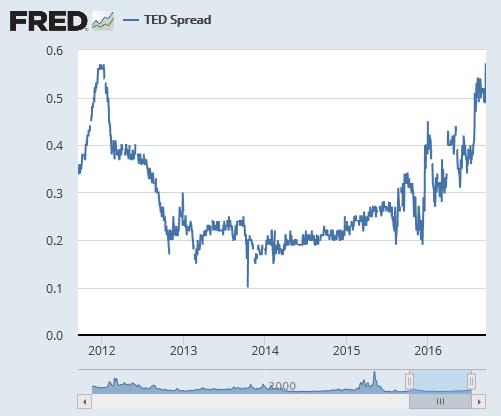 If one sees divergence in the indices, this can be a signal of a change in direction of the market and this was occurring in July of this year when the transports were weakening. 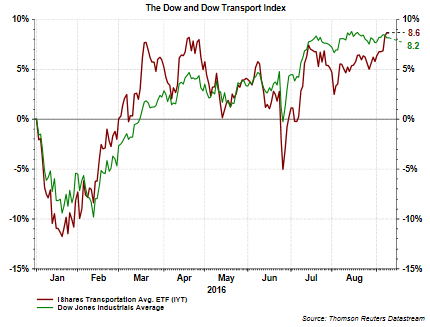 As of the close yesterday though, the year to date return of the transport index return now surpasses that of the Dow index return as can be seen on the below chart. The transport index weakness in late July has been quickly reversed in August and early part of September. Additionally, positive chart setups have triggered which portend potentially higher prices ahead for both indexes. 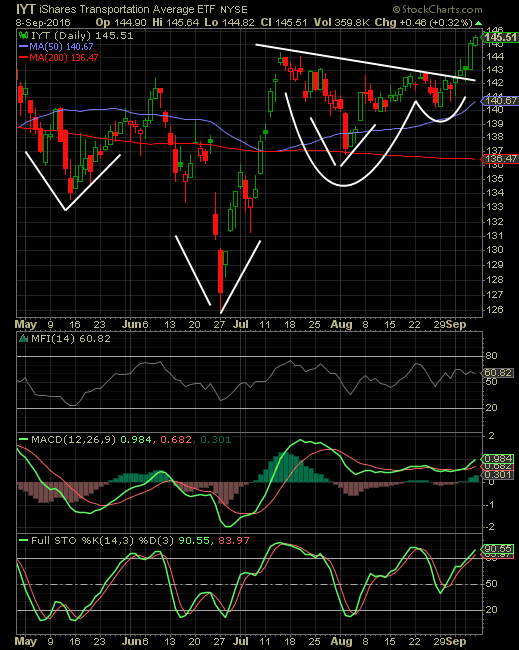 For the transports an inverted head and shoulders pattern has triggered with an upside target price of about $162 and cup and handle trigger with a lower target than the inverted H&S trigger of $150. 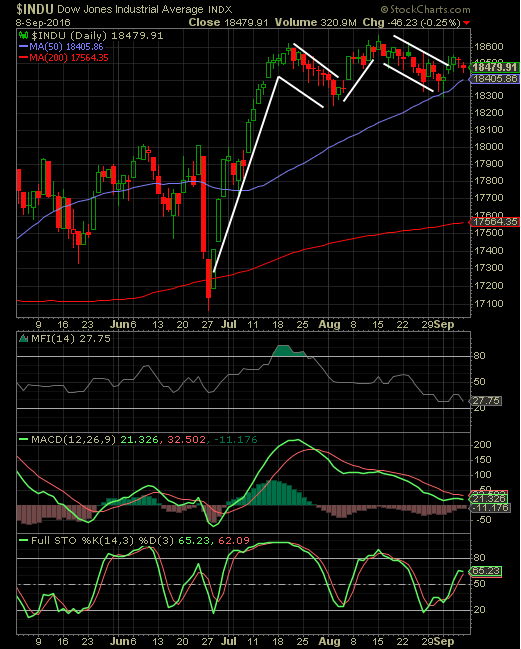 Additionally, in spite of the near sideways trading action in the Dow Industrials Index, bull flag formations are in play and are suggestive of potentially higher prices as well. The industrial and transport segments of the market seem to be indicating an improvement in the operating environment over the next 6-12 months. If earnings prospects continue to improve, as we have discussed in earlier posts, the odds of higher equity prices over the course of the next year seem likely. 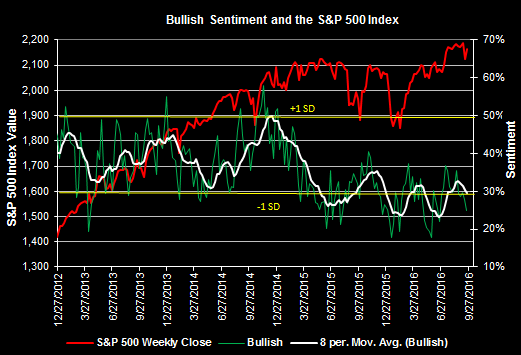 Individual investor sentiment continues to show a low level of bullishness and this has translated to continued outflows in equity mutual funds and exchange traded funds. 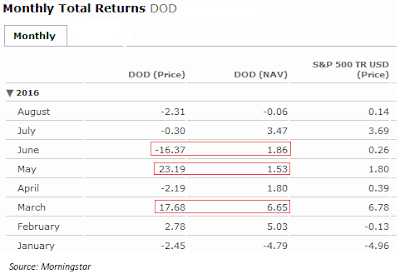 Almost a month ago I noted the strong outflow from equity funds and ETFs that occurred in July and this selling trend continued in the month of August. 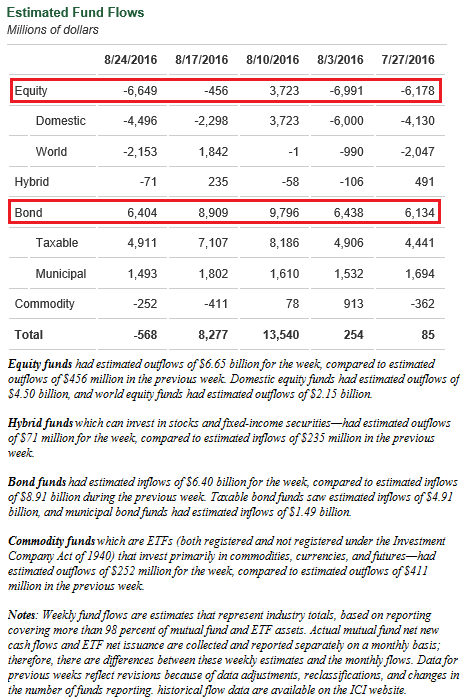 The outflows have caused assets in equity mutual funds to decline while equity ETF assets have increased on a year over year basis as of the end of July. The increase in ETF assets is largely due to the strong equity market returns from a year ago, for example, the S&P 500 Index is up over 12%.